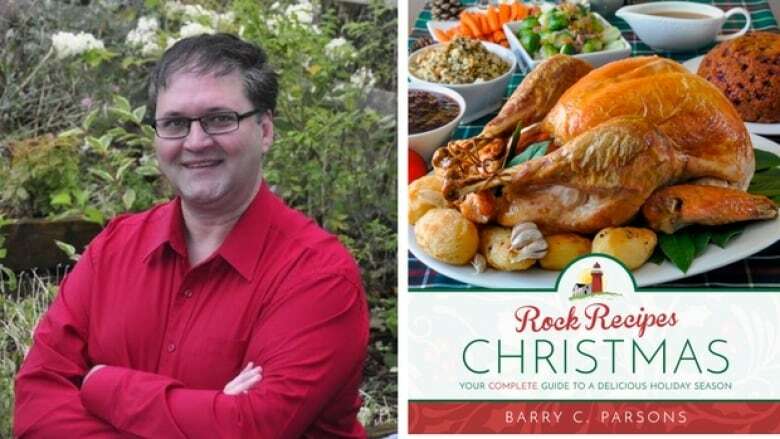 In this excerpt from a 2016 interview, Barry C. Parsons talks to Shelagh Rogers about his book, Rock Christmas Recipes. Cooking blogger Barry C. Parsons has released a new cookbook full of holiday recipes. Barry C. Parsons describes himself as a lifelong food obsessive. For more than a decade, he's been running the cooking blog Rock Recipes, which puts a Newfoundland twist on recipes he's created and adapted. The blog started as a hobby, but it's turned into a full-time job, with three cookbooks to date, including the latest, Rock Recipes: Christmas. Parsons spoke to Shelagh Rogers in 2016 from St. John's, NL. "I do an awful lot of baking at Christmas. We had a very close extended family, and I learned a lot from all those great cooks and especially bakers in my own family. There were six of us kids in my close family, and my mother always had the big deep freeze in the basement full of cakes and squares and cookies and snowballs. This was all done weeks in advance, and of course us kids would steal them out of the freezer. I think a lot of us still prefer them frozen, because we stole so many that way." Are butter tarts the new fruitcake? "I don't think anything's ever going to be the new fruitcake. It's like I say on the blog and in the book — you're either all in or all out when it comes to fruitcake. People always say they hate fruitcake, but the numbers on my blog tell me they're all lying. Fruitcake is a local tradition, an integral part of the Christmas celebration here in Newfoundland — making that cake weeks early and soaking it in that screech rum or whatever else you were soaking it in, it became part of the memory and tradition of Christmas." Barry C. Parsons's comments have been edited and condensed. Here in Newfoundland, a cherry cake is an absolute must-have for Christmas. A moist, dense pound cake with glacé cherries and flavoured with almond extract, this treat is a universal Christmas favourite in almost every Newfoundland household I know. This recipe came from a family friend decades ago and it's the one I've been using ever since because of the added richness and flavour provided by using undiluted evaporated milk in the batter. Cherry Cake is also great for gift giving at Christmas time and we regularly make many of these as loaf cakes for friends and neighbours every year. Rinse the cherries in a colander to remove any syrup that they may have been stored in. Pat them dry between layers of paper towels. This step helps prevent the cherries sinking into the batter as well. Depending on their size, cut them into halves or quarters and set aside for later. They will get tossed in ¼ cup of flour later but not until just before they are folded into the batter. Sift together the 3 cups of flour and baking powder. Fold dry ingredients into the creamed mixture alternately with the lukewarm milk, beginning and ending with the dry ingredients. As a general rule, I add the dry ingredients in 3 portions and the milk in 2 portions. Fold in the chopped glacé cherries that have been tossed at the last minute in the ¼ cup flour. Bake in greased and floured spring form pan, tube pan or 2 loaf pans, lined with parchment paper. Bake at 325 degrees F for 45 minutes–1 hour depending upon the size of your pan. Baking times vary greatly on this recipe so rely on the toothpick test to ensure that it is properly baked. When a wooden toothpick inserted in the center comes out clean, it's done. Be careful not to go past this stage or the cake will be dry. Excerpted from Rock Recipes: Christmas by Barry C. Parsons. Reproduced with permission from the author. All rights reserved.